We’re happy and proud to report that our leadership role as a business model for sustainability has not gone unnoticed. The State of Utah has twice given our company the annual award for “Excellence in Manufacturing for Environmental Consciousness,” the only company to be so honored. 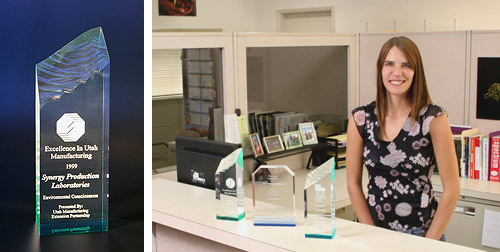 The prestigious Nutrition Business Journal has also honored us with two awards: the Organic Excellence Award and the Environment and Sustainability Award. Read the full article here. Thirty years of research and the creation of far-reaching technologies and groundbreaking raw materials have made Synergized Ingredients the "company to watch" when it comes to certified organic and kosher, whole-food dietary supplement ingredients. "Over the past 25 years, I have toured and audited scores of dietary supplement facilities. One stands out: Synergized Ingredients™. Synergized Ingredients is the model of utter commitment to quality, ethical and sustainable business practices and impeccable GMP compliance." "The recipient of multiple national awards, Synergized Ingredients offers products and services that are both extensive and vertically integrated. From its organic and proprietary Synergized® raw materials and innovative product development to complete start-to-finish custom manufacturing - all are some of the finest I have ever seen. Synergized Ingredients has quietly created a world-class company to the benefit of our entire industry." "Synergized Ingredients is a pre-eminent nutraceutical firm to be watched. In the supplement industry, it is rare to find a more aggressive and uncompromising quest for quality than demonstrated by Mitchell May and his professional staff. With their pharmaceutical-grade processing facility, independent ingredient testing (before and after manufacturing), state-of-the-art drying technologies, zero tolerance for post-process residue and staunch SOPs, Synergized Ingredients exemplifies what the supplement industry should be." "Synergized Ingredients operates under strict GMPs, certified organic and quality systems that far exceed the norm within the nutraceutical industry. For sourcing, testing, manufacturing, warehousing, transportation and quality assurance, Synergized Ingredients has systems in place that ensure the consistency, efficacy and superior quality of its products. Everything they do revolves around customer service and satisfaction, and they are driven by innovation and quality. Their products and services are a clear demonstration of their passionate commitment. SPL is a qualified and preferred supplier for Jamba Juice." "Synergized Ingredients represents a remarkable confluence of deep expertise in organic nutritional raw materials, proprietary technologies, long relationships with sources worldwide and a sterling reputation for all business dealings. I have been repeatedly impressed on my visits to SPL's production facilities with the level of quality and attention to detail given to every aspect of quality control, material handling and production processes." "On a personal level, I have the highest possible regard for Mitchell May and his team, and deep respect for the environmental and sustainability commitment upon which Synergized Ingredients is built."